The literary journal LUX, which is the multimedia counterpart to Lumina Magazine out of Sarah Lawrence, is publishing a section of a cross-media book I’m working on. A section of this experiment is set to be published by LUX, & I’ll update this page then with more details, but if you follow this link, you can see the online portion now. JFK1, Reconsidered follows in the literary tradition of works inspired by cryptohistories and political forgeries, and seeks to continue the bell-knelling of Orwell’s prescient warning: “He who controls the present, controls the past.” The book arrives in five parts, all of which reference a long poem at the book’s center, somewhat in the vein of Nabokov’s Pale Fire, involving metatext and hypertext and played out within the harried noir atmosphere of a dangerous quasi-futuristic postwar environment. The following note will help explain what you’ll see if you visit the online portion, which you can do by clicking here. 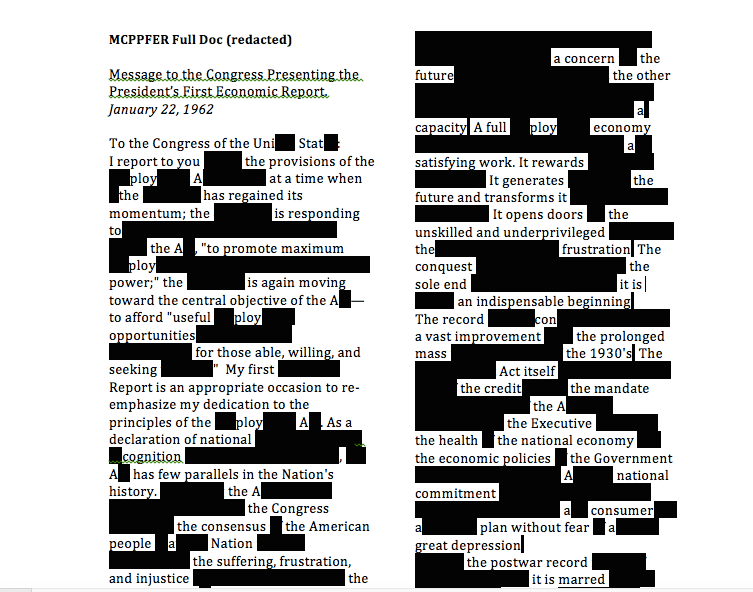 Note to the reader: This manuscript is an archive, which is to say it is an amalgam of various types of writing & performance of various styles/genres that speak to & branch out from a central poem, known as the “MCPPFER Doc,” itself devised from a speech made by President John F Kennedy in 1962. The written transcript of the speech was later revised by political enemies of the President, in order to cast him as a warmongering enemy of the state, & thus wrestle rule from political progressives. history. It begins with a personalized greeting, with advertisements, & details the referenced documents. The Subterranean Mammal, concerning the revelation that the original poetic “MCPPFER Doc,” housed at the Smithsonian, is fraudulent. The document has a special place in history, & has been often used to undermine progressive politics & government for over two centuries. Styles is writing from a time of relative peace, after a number of civil wars split the United States into factions, which have since reunified. The impetus for the wars can be traced back to a speech delivered by the infamous Prez JFK1, who was widely despised for his cruelty towards the citizenry, his excessive economic spending, disturbing foreign policy, perverse appetites, and outright bold brutishness. This particular piece of investigative journalism by Mr. Styles will go on to foment another revolution, cited as the main impetus for the fall of the historically conservative future government & the redrawing of the Uni Stat’s newest Constitution. poem by an unknown scholar (or historic troll) & used by two centuries of conservative Uni Stat leaders to show how terrible things can actually get if conservative ideals are challenged. JFK has become, in essence, the Mad King straw man, the bogeyman of politics.